A GROUP OF PLESIOSAURS—ocean-dwelling cousins of the dinosaurs—keeps safe by swimming in a family pod. But then one baby plesiosaur swims too far from its mother and attracts the attention of something very large and very hungry, and the struggle for survival is on. A unique blend of digital artwork and landscape photography illustrates this thrilling encounter. 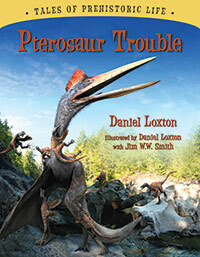 This is the third and final book in the science-informed series Tales of Prehistoric Life the first of which was Ankylosaur Attack—the 2012 Canadian Children’s Book Centre Winner for “Best Books for Kids & Teens.” Book two in the series is Pterosaur Trouble: a dramatic, paleofiction tale of perhaps the largest flying animal ever to exist—the mighty pterosaur Quetzalcoatlus. 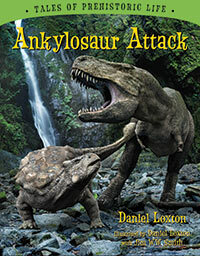 Another prehistoric predicament from the creators of Ankylosaur Attack (2011) and Pterosaur Trouble (2013), with similarly nongory but otherwise photorealistic illustrations … Go, Cryptoclidus! [A] superb balance between intensity and heartfelt tenderness…the perfect blend of scientific facts with child-friendly storytelling. … Highly Recommended. Plesiosaur Peril is a fantastically illustrated children’s book that uses the fictional story of an individual animal to paint a picture of the lifestyles of ancient animals, using scientific data where possible…so go buy it!